This house is intended to function as a porous and fluid site of delight and production. It is located in downtown Melbourne for a small extended family [4 people, 3 generations] on a compact site with limited access to light and views. 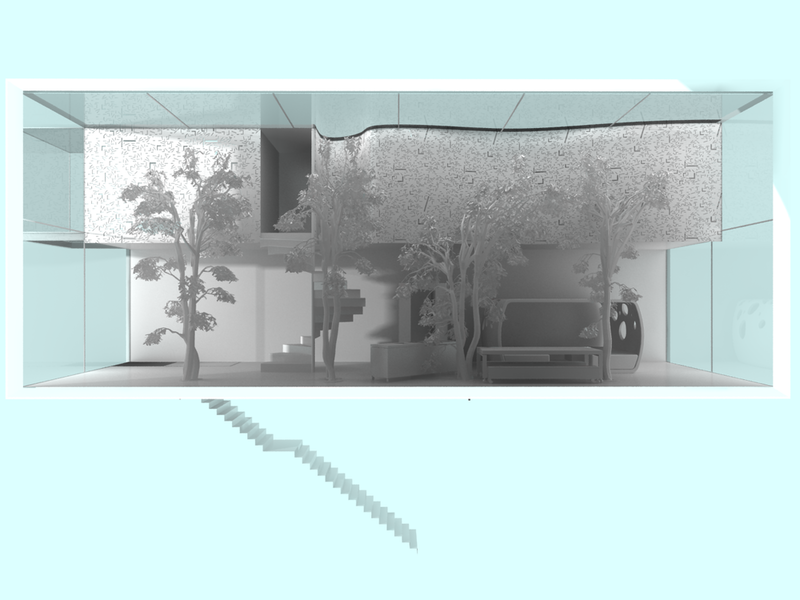 The house is understood as an active node within the network of cellular automata that compose the city. 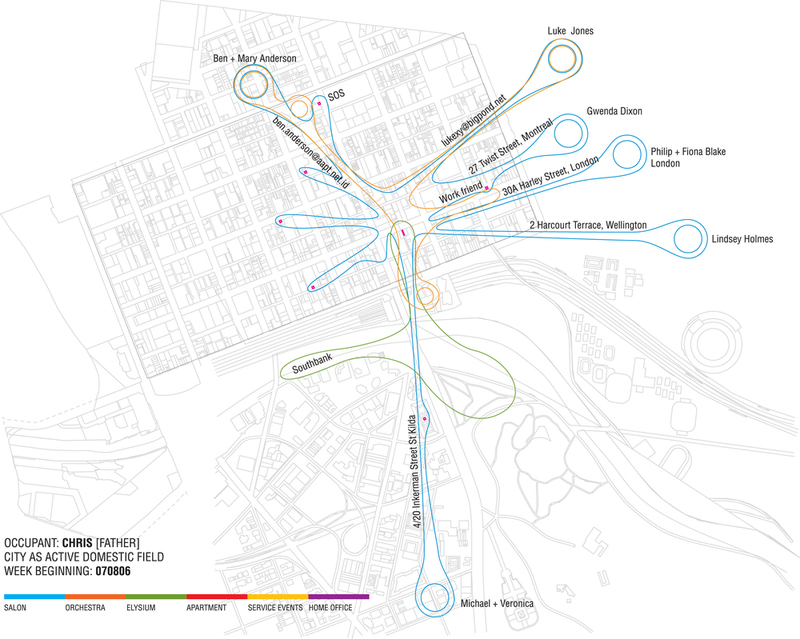 It serves to connect the occupants to the physical, social and cultural ferment of the city and it's electronic virtually-extended digital counterpart. 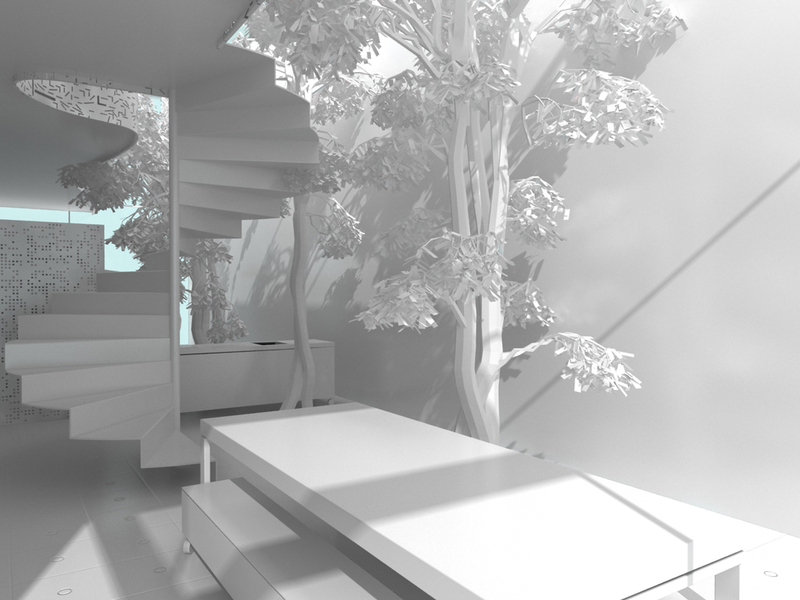 As such the house functions as a campsite but without the benefit of a beautiful context. It is not a villa. Here the campsite is easily reconfigurable to meet the flux of social, work and creative demands but also the house must act as the generator of delight. There is no possibility of Shakkei. Space and delight can not be visually borrowed here. They are generated within. 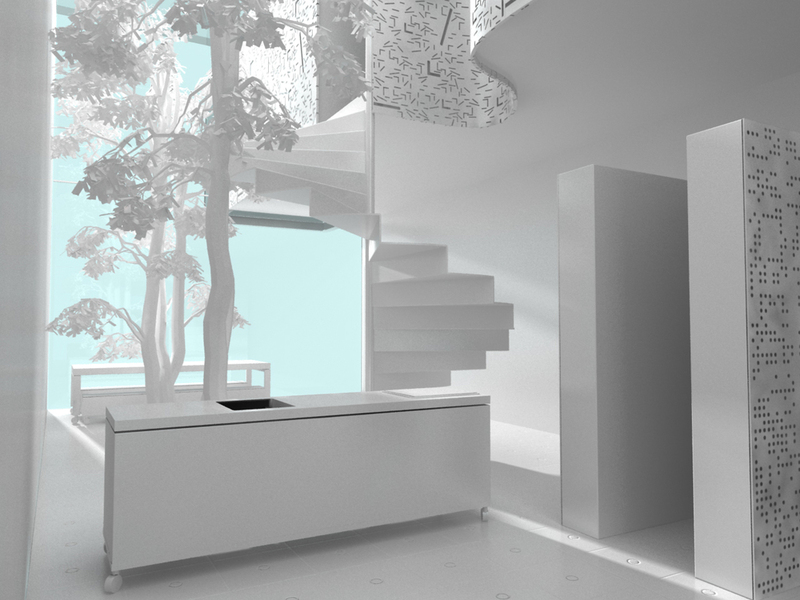 The house therefore is a kind of urban, yet domestic foyer, a garden in a box. 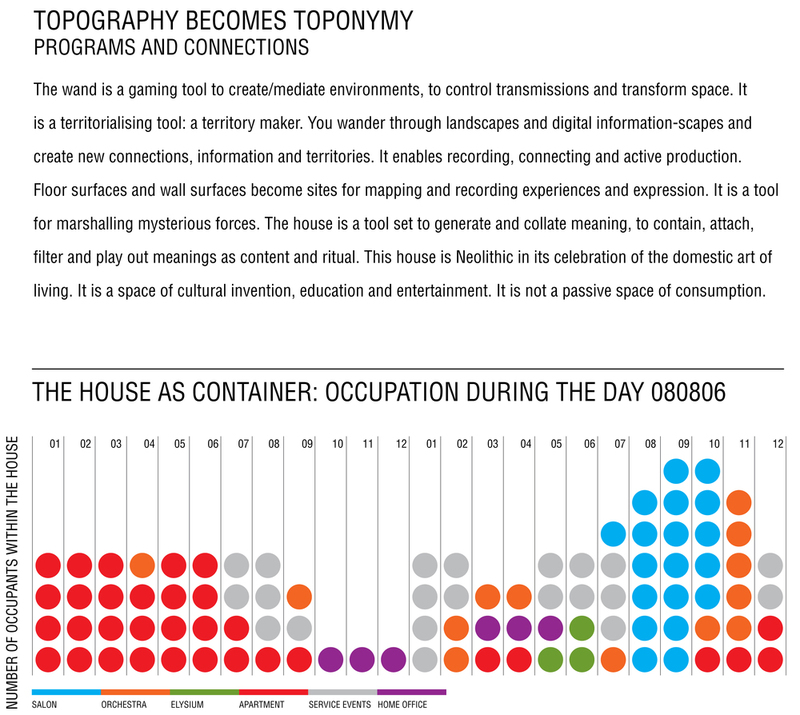 The domestic program generates domains of occupation within the house. These domains are defined by the kinds of relationships they embody, within the family and outside the family. The house is a flexible tool to frame these relationships as they evolve. Boundaries between the house and city and between domains within the house are understood as exchange boundaries, controlling the flow of material and information between them. There must be safety in a home but there can also be ambiguity, porosity and flux. As such the house is understood through processes of exchange rather than any sense of finite boundaries. These boundaries may be intentionally complex or fractal in nature, becoming exchange amplifiers. This is intended as a possibility for both physical and digital boundaries. All spaces within the dwelling are living spaces. The services; electrical, hydraulic, digital, communicative are available anywhere within the dwelling Ð plug and play from watching a DVD to using the toilet. All the technology used is off-the-shelf. 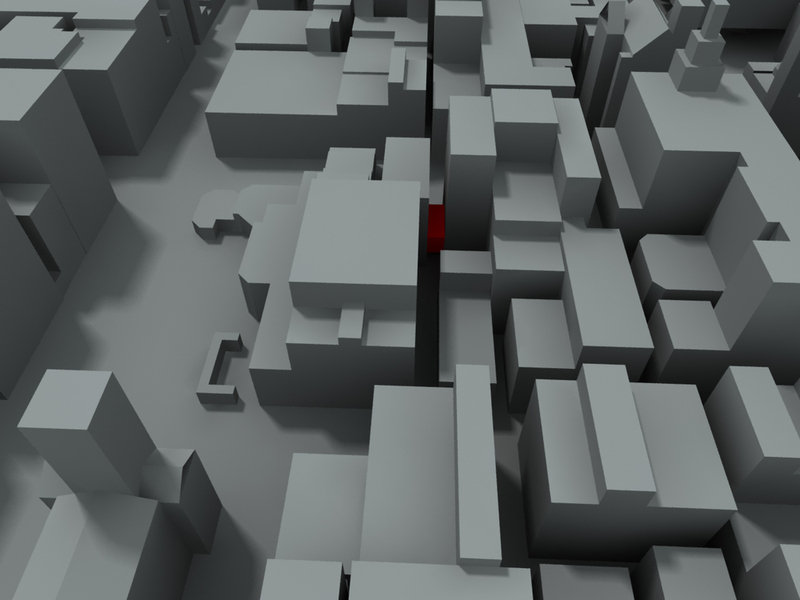 The occupants use the city as a dense and vibrant field of discovery and interaction. They hunt for and collect experiences, inspiration and cultivate relationships. They bring these experiences back to the dwelling to absorb them and create or produce responses. This process becomes part of the continual self-transformation of the occupants as well as information for scenograghic transformations of the home. Creative production within the home can be transmitted back out to the city and the digital hinterland as a contribution to the cultural milieu. 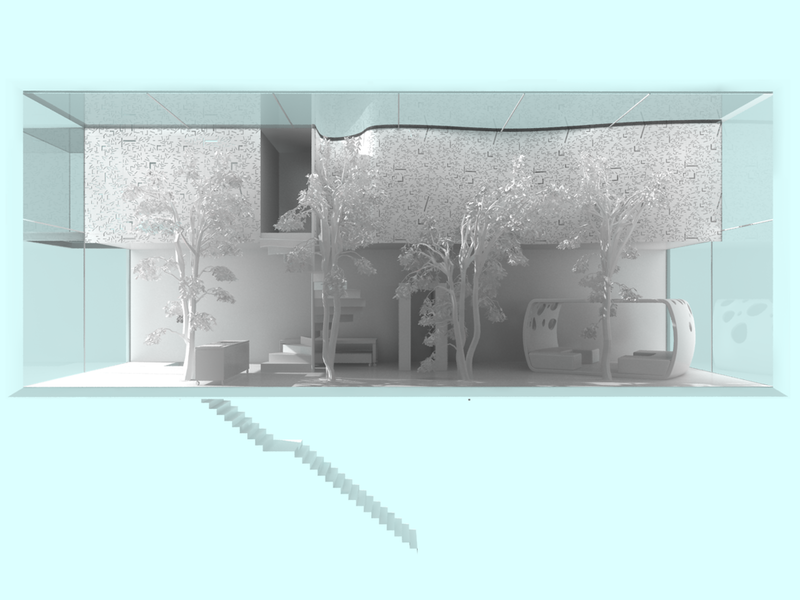 The house is both a microcosm of the city and cell of the city. It participates in the life of the city, draws from city, and seeks to frame the city as home. The wand is a gaming tool to create/mediate environments, to control transmissions and transform space. It is a territorialising tool: a territory maker. You wander through landscapes and digital information-scapes and create new connections, information and territories. 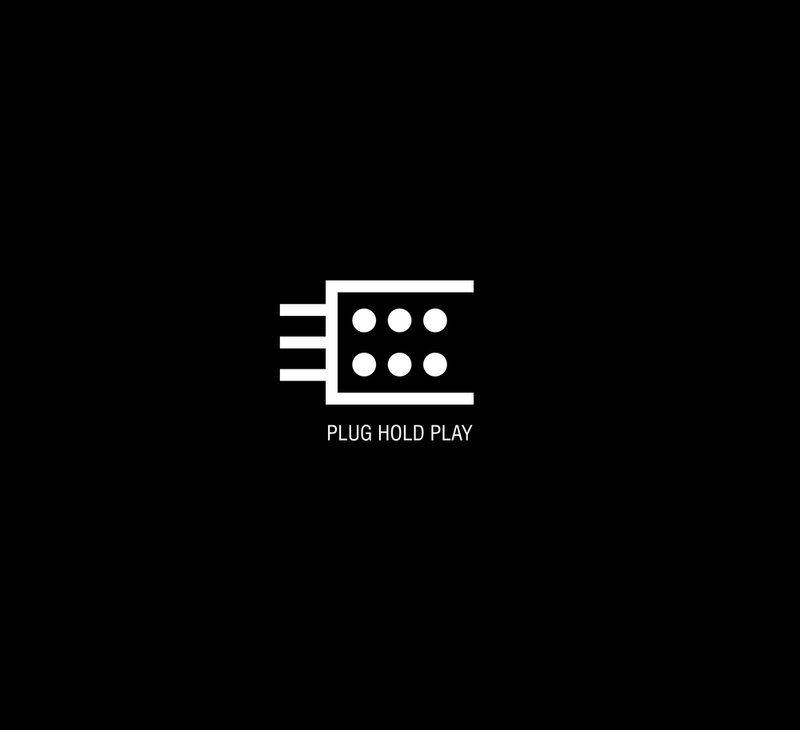 It enables recording, connecting and active production. Floor surfaces and wall surfaces become sites for mapping and recording experiences and expression. It is a tool for marshalling mysterious forces. The house is a tool set to generate and collate meaning, to contain, attach, filter and play out meanings as content and ritual. This house is Neolithic in its celebration of the domestic art of living. It is a space of cultural invention, education and entertainment. It is not a passive space of consumption. The house is a space of separation and connection. 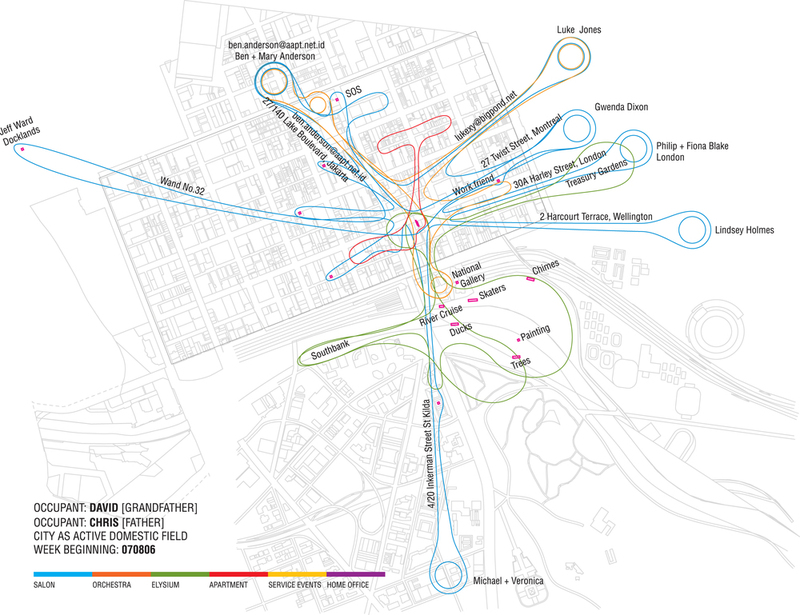 It plugs into the physical and communication networks of the city and the cultural context. The house is also a container holding, cultivating and nurturing the family's identity, memory and safety. Finally the house provides a protected space for the family to play and create. The dwelling program addresses the demands of: sanctuary, repair, stabilisation and production. 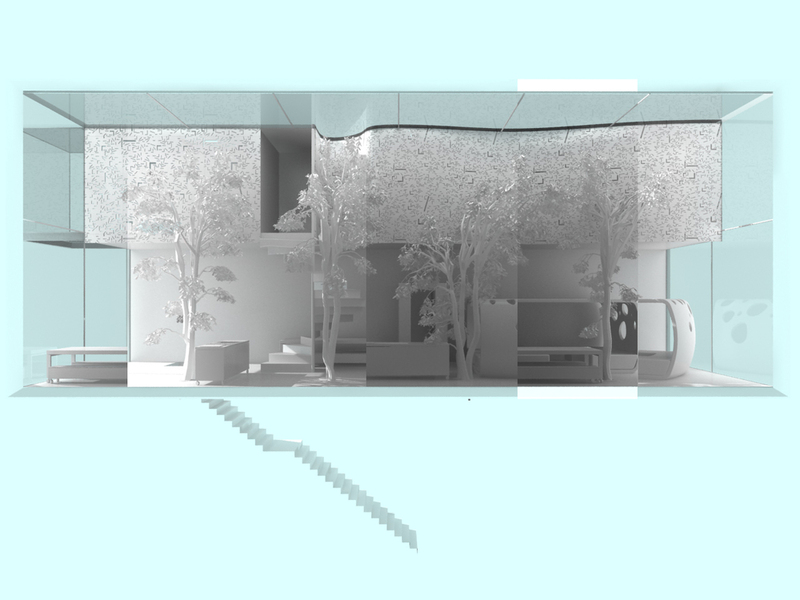 The dwelling program is conceived as composed of 5 spatial types. These are framed as territories of the mind and translated into spatial possibilities and sets for action. In the parlance of electronic communications technology, architecture is a control system for experiences. 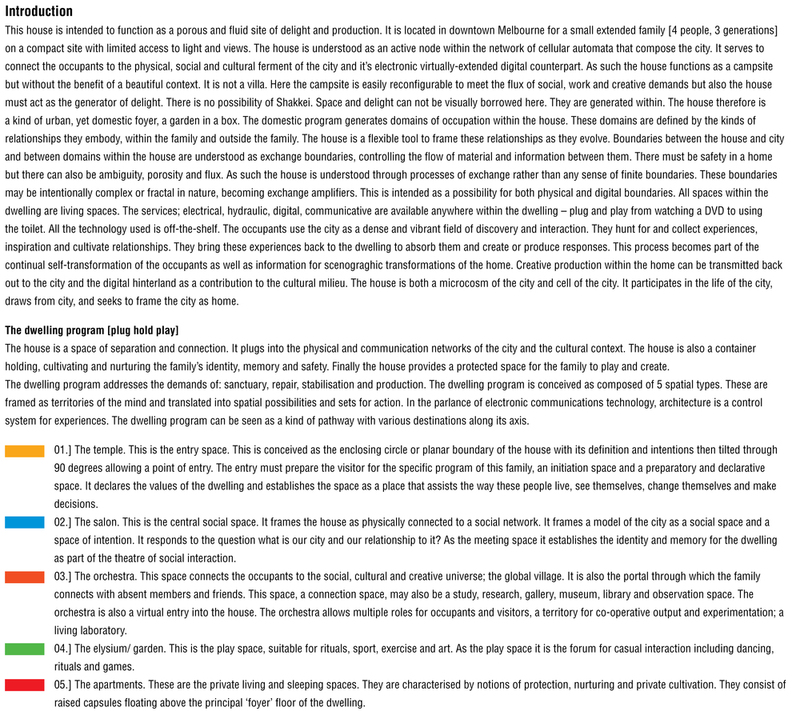 The dwelling program can be seen as a kind of pathway with various destinations along its axis..
01] The temple. This is the entry space. This is conceived as the enclosing circle or planar boundary of the house with its definition and intentions then tilted through 90 degrees allowing a point of entry. The entry must prepare the visitor for the specific program of this family, an initiation space and a preparatory and declarative space. It declares the values of the dwelling and establishes the space as a place that assists the way these people live, see themselves, change themselves and make decisions. 02] The salon. This is the central social space. It frames the house as physically connected to a social network. It frames a model of the city as a social space and a space of intention. It responds to the question what is our city and our relationship to it? As the meeting space it establishes the identity and memory for the dwelling as part of the theatre of social interaction. 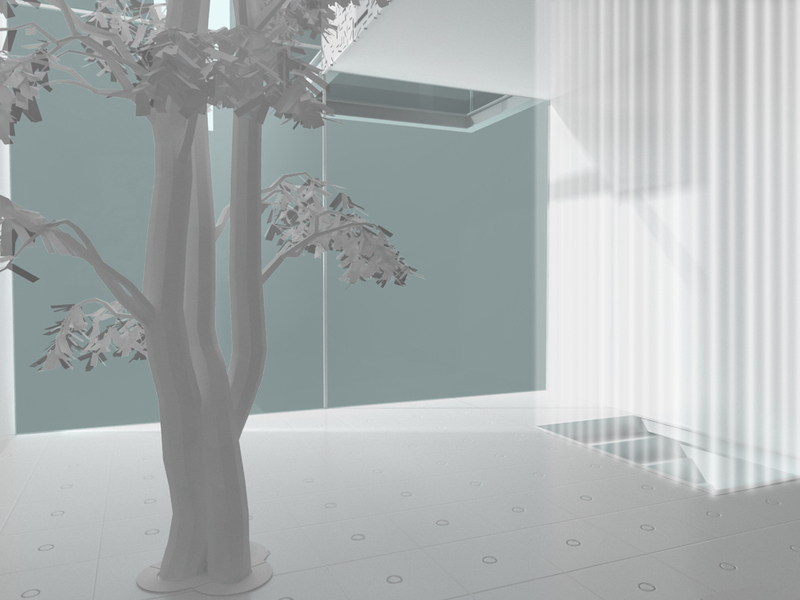 04] The elysium/ garden. This is the play space, suitable for rituals, sport, exercise and art. As the play space it is the forum for casual interaction including dancing, rituals and games. 05] The apartments. These are the private living and sleeping spaces. They are characterised by notions of protection, nurturing and private cultivation. 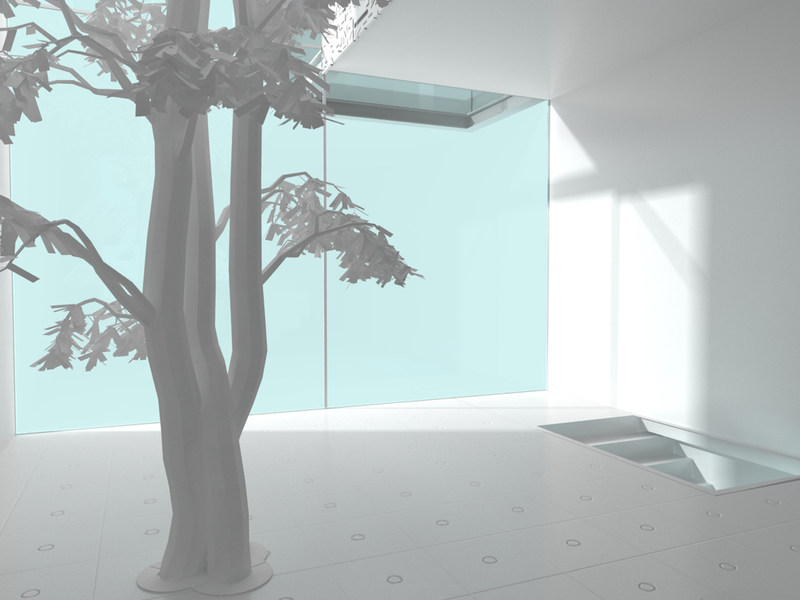 They consist of raised capsules floating above the principal 'foyer' floor of the dwelling.